Used for mounting HALOGEN Silver Bullets with 5/16"-18 Mounting Bolt to Forks. Different sizes available. Choose size above that you need based on information below and measurement if applicable. Prices vary by size, click on the size that you need to see the discounted price. If your bike is not listed below, they probably will not work. These sturdy, chrome-plated mounts are just the ticket to attach Silver Bullets (or custom lights using 5/16-inch mounting hardware) to fork tubes. 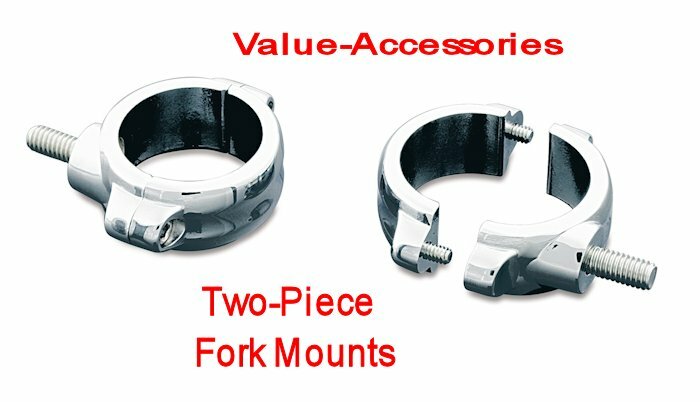 39mm, 41mm, 49mm and (54mm-58mm inverted forks) sizes are offered to fit many popular models. 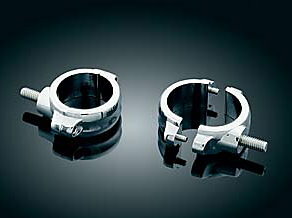 For Non Shrouded Front Forks and mounting Clamps above the Lower Triple Trees. Softail, Dyna, Sportster, and V-Rod. Measure or consult your dealer or manual for dimensions.